We are a leading Exporter of pws-870 tablet pc and rugged tablet computer from Hyderabad, India. 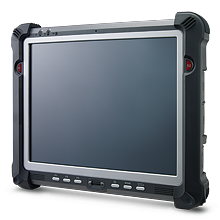 The PWS-770 is a rugged mobile tablet featuring a 10.4" XGA resolution TFT LCD panel and an Intel® Atom™ N2600 1.6 GHz processor. It comes with 802.11 b/g/n WiFi, Bluetooth 4.0, a 2M pixel camera. It also has built-in optional GPS and WWAN 3.75G antenna. PWS-770 optional devices include an RFID module with antenna, a 1D/2D barcode scanner and an MSR card reader. PWS-770 is a fully functional communication device suitable for any outdoor application. It carries an IP54 rating for protection against dirt, dust and water. PWS-770 can also survive a 4-foot drop. Advantech's PWS-770 is a strong tablet PC for industrial and commercial use in any environment.